Instead of a fishing trip weekend, Troy Jackson and I decided to head down to Dreamland. We left, Gunnison Utah about 1900 on July 7th 2002. 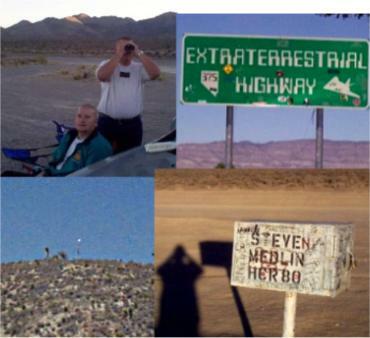 We also took a friend and fellow Utah UFO Hunter member; Beau Hackwell. We made good time and arrived at the Groom Lake Border around 0035 on July 8th. We saw a strange glowing object in front of us and behind us as we traveled the 13.8 miles down Groom Lake road. Must have been Cammo Dudes doing something. Cammo Dudes are the private security hired out here. They are employed by EG&G who are government contractors. They tend to wear desert cammo gear so hence the nick name. Then we saw the signs: No Trespassing, No Photography, and Use of Deadly Force Authorized. We noticed a dark, late model sedan with tinted windows and no license plate, or dealer temp tags right in front of the signs on the right hand side of the road. It was at that instant we got the standard Cammo Dude welcome, from EG&G security. On a hill to the right of the security border, a vehicle lit us up. Headlights on bright and a spot light right on us, it came tearing down the hill at us. I told Troy to hold his ground and he did. The vehicle then came to a stop halfway down the hill and just kept us lit up. They were just using the standard Area 51 Bluff, and were probably trying to stay awake. It woke three UUFOH researchers up! EG&G security are powerless outside the perimeter of Dreamland but, we did not want to see how they acted if we crossed the border and tried getting to the gate house, hidden around the hill about .85 miles further. We kept remembering "Use of Deadly Force Authorized," but fines of $1000 and 6 months in jail sounded more plausible and therefore scarier. We looked around and left. We were followed by two vehicles, the unmarked and illegally tagged sedan, plus the ever present Ford F-150 EG&G vehicle. We also passed another truck coming from the opposite direction. It had US Government plates. We later learned it is the new EG&G Chevy 2500 dark gray 4 X 4. We made the requisite trip to the famous black mailbox (now a bulletproof white box), then preceded to the gravel viewing area for our Skywatch. It was a dark and moonless night. The kind of night that they like to fly Top-Secret aircraft at "The Ranch." I and Beau seen it first. It was a brilliant strobe flash that moved an incredible distance in the amount of time it did, before another brilliant flash. Meteor? No. Tumbling Space Junk? No. Ball Lightning? No. Swamp Gas? Not in the middle of this desert! Military craft? No. Military craft are forbidden to over fly this area known as Dreamland, the Ranch, Area 51, etc. Military pilots from Nellis AFB and elsewhere refer to this restricted area as "The Box." And can not fly in this restricted airspace. Not, even during heated Red Flag engagements (Air Force version of the Navy's Top Gun exercises). They must break off all dogfights and not go into "The Box". So what was it? I think it was what is called a Fastmover by Groom Lake Approach. It fits the description. It is an Unidentifiable. It moved atypically, and too fast, to be conventional military aircraft and it was flying over "The Box". It was not natural phenomena either. Even tumbling space junk was quickly ruled out. A definite UFO. Here is an article I found that matches the description of what we saw I believe it to be the same thing, but have yet to confer with Troy and Beau. The object was seen twice more at about 20 minute intervals. We got little sleep, maybe 45 mins, then was up for the white bus to go down Groom Lake road. We wanted to see the Janet flights come in but got hungry, so it was off to the Little A'le Inn. I spoke at length with Joe Travis the owner, after having breakfast there. Getting his views on Bob Lazar and what goes on out there. He believes Lazar, had a sighting himself, and thinks extra terrestrial craft as well as beings are out there. These views are in line with my own. We then went to the North Gate for photos of that entrance to Dreamland, or as it is known now as DET 3 AFFTC, Air Force Flight Test Center Detachment 3, which is a detachment not from Nellis but the old home of test plane flights, Edwards AFB. Troy quickly noticed the radar and surveillance facilities on top of Bald Mountain. We reached the North Gate and saw a security officer hiding behind an open door. This puzzled us, until I did further research today. Rumor has it that any "Cammo Dudes" careless enough to get photographed, may get fired. They are real no non-sense when it comes to security matters and who works out there. We then went back to the Groom Lake border and took photos, noticing the radio controlled cameras, and the ever present security up on the hill. They didn't seem to have much of a sense of humor. We were followed again, and again. Before we went back to the Groom Lake Border we took a road to the west, and ended up at the Nevada Test Site, which lies adjacent to but south of Area 51. We ran into a sign designating that point as Entering Area 61 contact Blackjack, advising us to use Channel #4 to gain entry. We didn't think they meant us. So we departed, before our friends showed up. With the heat, sleep deprived ornery researchers, and prospect of eating in the smoke filled Little A'Le Inn again proved too much for this spearhead group of the Utah UFO Hunters, and another night of sky watching was replaced with at red eye express drive home. We returned to Gunnison within 24 hours of leaving. Troy who drove the whole way had another hour and a half to go. UFOs were seen, and I am now 1 for 4. That is 1 UFO sighting out of 4 Official all nighter sky watches. This was my second UFO sighting. Hopefully the next will be a close up saucer with occupants. The trip was a success! As always Keep Looking Up!